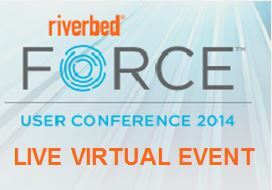 Here at Riverbed, we are extremely excited about our upcoming user conference, Riverbed FORCE. Between the thought-provoking keynote speakers, over 60 technical sessions and hands-on labs, an innovative Agenda Builder to help you personalize your schedule, and fun social events, there is a lot to be excited about. We wanted to be able to share this excitement it with you, even if you are unable to attend Riverbed FORCE. That’s why we are thrilled to announce our free live virtual event! On Tuesday, November 4th, the first full day of FORCE, we will be holding a live virtual event from 8:30 am-12:00 pm PST. This virtual event will include keynotes by Riverbed CEO Jerry Kennelly, Intel CIO Kim Stevenson, and Riverbed’s Chief Scientist Hansang Bae. Zscalar Incorporated’s CEO Jay Chaudhry, Akamai Technologies’ Rick McConnell and Riverbed’s Paul O’Farrell will also be presenting. In addition to the keynotes, from 9:15-10:30 am PST, we’ll be announcing innovations within the Riverbed SteelHead product family. These innovations will include new visibility, control and optimization capabilities. You’ll learn how you can achieve deep application visibility in a hybrid world to maximize end-user productivity, how to simplify management, reduce costs, and ensure peak performance with application level control, as well as how to optimize secure delivery of all applications across all networks. If you are unable to go to Riverbed FORCE, this is your chance to get in on the action. To learn more and register, click here. For more information on and to register for Riverbed FORCE, click here.